Tornado – Photo Credit: OAR/ERL/National Severe Storms Laboratory (NSSL). Abstract: Mediaeval chronicles describe 21 tornadoes in Britain prior to the year 1500. 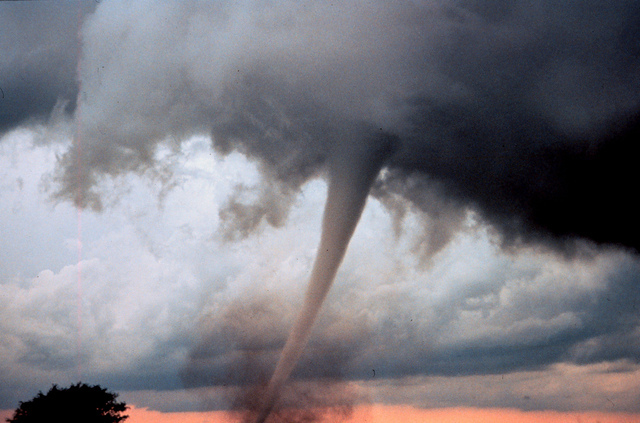 Although the meanings of some of the accounts appear unclear at first sight, the features reported can nearly always be explained by reference to modern tornado cases. Introduction: Although the list of tornadoes given by Brooks includes two from as far back as 1729 and 1638, and Manley (quoting Stow’s Chronicle) describes a case at Nottingham in 1558, these are by no means the earliest British examples known. Lane mentions two which occurred in 1091 and 1140. It seems that he was quoting from the well-known compilation of Britton, which contains descriptions of no fewer than 21 certain, or highly probable, tornadoes (though Britton nowhere uses this word). In the present article quotations are from Britton unless the name of the chronicler is cited, in which case they are my own translation from the original Latin text. The first undoubted tornado occurred in London on Friday, 17 October 1091, although there are one or two earlier reports of storms which may have included a tornado. The ‘violent whirlwind’ as Florence of Worcester calls it killed two men as well as allegedly demolishing 600 houses and a number of churches. The next example, on 19 May 1141 at Wellesbourne, Warwickshire (misdated 1140 by Britton) hurled the church roof across the river Avon, and damaged almost 50 houses according to John of Worcester.